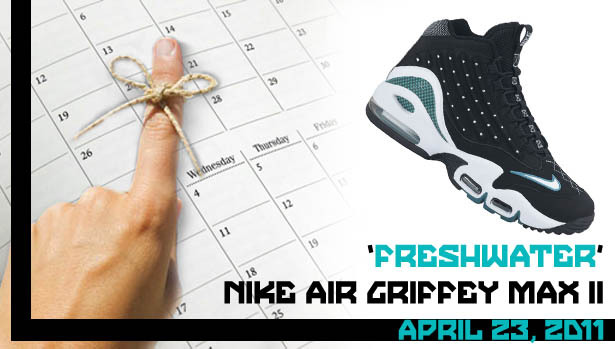 Release Reminder: Nike Air Griffey Max II - "Freshwater"
Gone, but not forgotten. Ken Griffey's second official Nike signature shoe will be released in its most popular colorway tonight. Gone, but not forgotten. That old time saying is a great way to describe "The Kid" Ken Griffey Jr. His sudden departure from the game of baseball nearly a year ago not only saddened fans of America's Pastime, but the sneaker community as well. Many of us grew up watching Griffey and remember him as being one of the most complete players to ever step on a baseball field. The somewhat controversial way he exited will never overshadow that picture-perfect swing and million-dollar smile. Griffey will forever be an icon to baseball and sneaker fans alike. To drive that point home, one of the most anticipated releases of 2011 will hit stores tonight when Ken's "Freshwater" Nike Air Griffey Max II returns to retail. Almost a direct pull from the original "Emerald" colorway, the shoe features a black upper with white contrast detailing on the quarter panel, tongue and midsole. The "Freshwater" nickname comes from the teal-ish color used to accent the Swoosh border, carbon fiber heel support, visible Max Air unit and outsole. 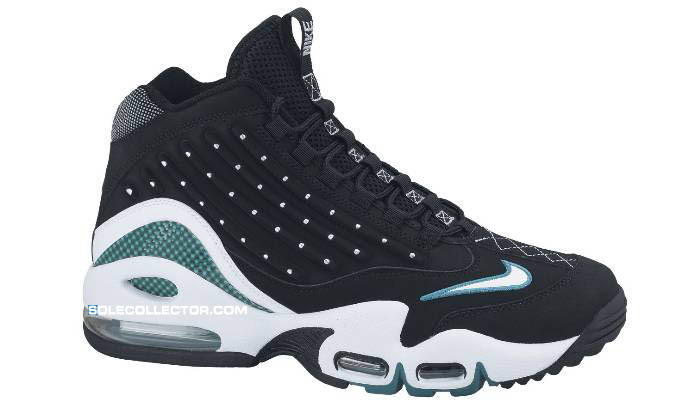 Of course, embroidered on the heel is the famous Griffey "Swingman" logo. Look for these to be available tonight at retailers like Eastbay and NikeStore, and in-store tomorrow.